Official photos of a couple of Samsung Android smartphones just appeared. The Galaxy Ace S5830 makes its second public appearance, while the Galaxy Suit S5670 is only now taking its first trip through Rumorland. 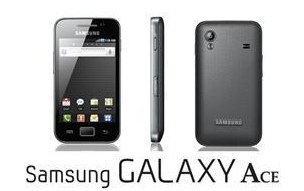 Samsung Galaxy Ace S5830 was initially known as Galaxy Mini, when it leaked a couple of days ago. Apart from the new name, the newly leaked low-resolution shot doesn't reveal any new information about the handset’s specs sheet. So far we have Android 2.2 Froyo, 5 megapixel camera with LED flash and an HVGA screen. Wi-Fi and Bluetooth 3.0 are also confirmed, while GPS and microUSB seem like a pretty reasonable guess. 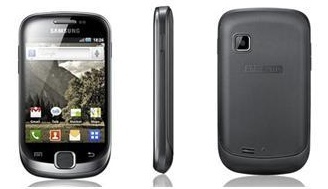 The Samsung Suit S5670 on the other hand, remains a complete enigma to us. Its model number and looks suggest mid-range functionality, so it might be the I5500 Galaxy 5 successor. Judging by the icons on the screen, the Samsung Suite S5670 is running Android 2.2 Froyo too. It appears that Samsung will be quite busy at the MWC this year. We’ve already seen four Android smartphones, including the Galaxy S 2. Undoubtedly the Koreans will also have some Bada devices to show us and we might even see a new WP7 handset or two. hahahahahaha! and again samsung did it again, the samsung galaxy 3 and the samsung corby android were left behind after getting android 2.2. wiw. not a new story. Another Android and another Galaxy. What's new?